Tesla Motors has responded to a magazine article that questioned the all-electric carmaker's ethics in handling the aftermath of the first recorded fatal crash involving a Model S sedan using autonomous driving technology. The Fortune article, published on Tuesday, called out Tesla and the National Highway Traffic Safety Administration (NHTSA) for not disclosing the May 7 accident for nearly eight weeks. The accident became public June 30 when the NHTSA announced its investigation. The Fortune article stated that the NHTSA and Tesla CEO Elon Musk failed to initially disclose "the very material fact that a man had died while using an auto-pilot technology that Tesla had marketed vigorously as safe and important to its customers." Tesla's Autopilot has automatic steering, lane keeping and automatic lane change. "The company and its founder knew about the fatal crash when it sold $2B of stock in May," the Fortune article stated. The accident, which took place in Williston, Fla., resulted in the death of Joshua Brown, 40, of Canton, Ohio, when a tractor-trailer crossed both lanes of a divided highway in front of the oncoming Tesla sedan. Tesla, which retrieved log data from the vehicle, stated in a June 30 blog that the Model S's autopilot sensors failed to detect the white semi-truck as it turned in front of a sedan with a bright sky behind it. The Model S's top was sheered away as it traveled under the truck and continued on for several hundred yards. In the blog, Tesla emphasized that the Autopilot feature, which has lane-keeping and automatic braking capabilities - among others - is a driving-assist feature and is not intended to be used as a fully autonomous vehicle technology. Autopilot "is an assist feature that requires you to keep your hands on the steering wheel at all times," and that "you need to maintain control and responsibility for your vehicle" while using it, Tesla stated. In a blog post Wednesday, Musk responded to the Fortune article, calling it "fundamentally incorrect" and a mischaracterization of Tesla's latest filing with the Securities and Exchange Commission. The SEC filing stated that Tesla could "become subject to product liability claims, which could harm our financial condition and liquidity if we are not able to successfully defend or insure against such claims." "This is just stating the obvious," Musk wrote in his blog. "One of the risks facing Tesla (or any company) is that someone could bring product liability claims against it. However, neither at the time of this SEC filing, nor in the several weeks to date, has anyone brought a product liability claim against Tesla relating to the crash in Florida." A Tesla Model S on a highway. Tesla informed the NHTSA about the May 7 crash on May 16, and it had "barely started" its own investigation of the incident at that time, Musk stated. On May 18, a Tesla investigator arrived in Florida to inspect Brown's Model S and the crash site and was able to pull the complete vehicle logs from the car. Musk said it was not until the last week of May that the company was able to finish its review of those logs and complete its investigation. As in the June 30 blog, Musk defended Tesla's Autopilot technology, stating that the Fortune article made two false assumptions: That the accident was caused by Autopilot failure; and that "a single accident involving Autopilot," is material to Tesla's investors. "To be clear, this accident was the result of a semi-tractor trailer crossing both lanes of a divided highway in front of an oncoming car. 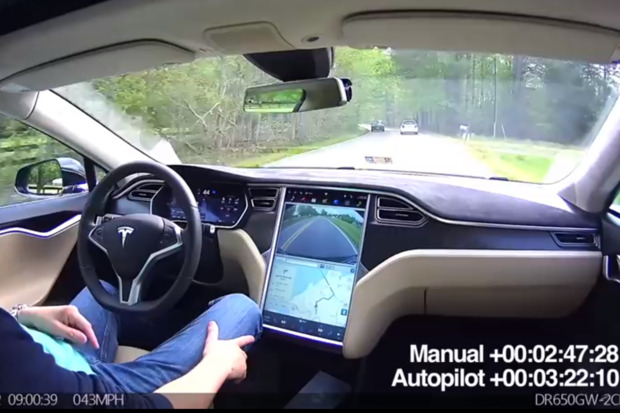 Whether driven under manual or assisted mode, this presented a challenging and unexpected emergency braking scenario for the driver to respond to," Musk wrote, adding there was no evidence to suggest that Autopilot was not operating as designed.